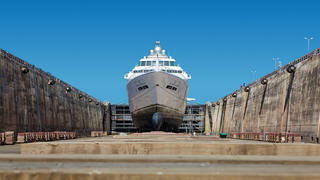 Refit specialist Compositeworks will be taking over the Atlantic Refit Centre in La Rochelle, with the yard getting exclusive access to the larger of the two dry docks. The two dry docks measure 107 metres and 176 metres respectively, meaning that some of the world’s largest superyachts could be refitted here. The Atlantic Refit Centre is the only superyacht refit facility on France’s west coast and Compositeworks has ambitious expansion plans for the site, which include adding a new 35 metre high hangar that will completely cover the 176 metre dry dock. The hangar is due to be completed in September 2018. 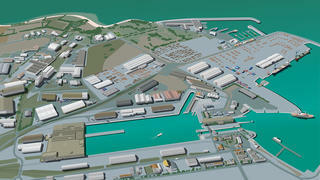 Stéphane Marcelli, director of the La Rochelle site, added that Compositeworks has already started to work with local contractors. Prominent refit projects completed at the Atlantic Refit Centre include the conversion of the 71 metre polar explorer yacht Enigma XK. In other Compositeworks news, the refit firm added that it plans to expand its Marseille facility with several new dry docks measuring up to 320 metres in length.